The low back is the third most common site of injury in swimmers. 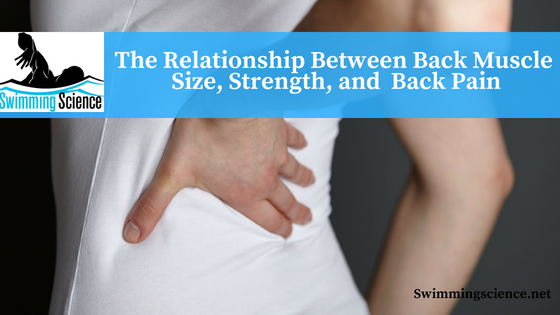 Despite the pain, many swimmers attempt to swim through the discomfort, leading to a classification of chronic low back pain (pain existing longer than six months). The chronic low back is believed to impair swimming by pain and reflex inhibition where pain leads to atrophy of the low back muscles. This atrophy is thought to cause loss of muscle strength. The low back muscles are important for maintaining a streamline position in the pool and performing extension for short axis strokes. This study looked to analyze the association between the morphologic characteristics and the functional aspects of back muscles, and to find out the factors that influence lumbar muscular function. The investigators looked at the relationship between muscle cross-sectional area (CSA) of the back muscles and isokinetic strength of the trunk flexors and extensors. Muscle CSA of the back muscles was analyzed via magnetic resonance image (MRI; T1 weighted axial view) at the level of L4 – 5. Size of the lumbar paraspinals, multifidus, erector spinae, psoas, and the intervertebral disc was recorded. Isokinetic strength was assessed during a constant angular velocity, with the patients sitting and bending forward or backward. The average CSA of the back muscles was 3421 mm2, disc 1,800.9 mm2. Average peak torque and average peak torque for body weight as measured by the isokinetic test were 56.3 Nm and 1.0 Nm/kg for trunk flexors, 98.5 Nm and 1.8 Nm/kg for trunk extensors, and 154.8 Nm and 2.8 Nm/kg for total trunk muscles. A correlation was found between the CSA of the back muscle and the strength of trunk flexors and also a correlation between the CSA of back muscles and strength of total trunk muscles were found. No relationship was found between CSA of back extensors and the strength of trunk extensors. This suggests back muscle CSA does not influence extension in a middle-aged population, but CSA of the back muscles does correlate with trunk flexion strength. This study took a myopic look at the low back, no recognizing the role of many variables influencing strength (muscle length, pain, etc.) making the results difficult to translate practically. Lee HJ, Lim WH, Park JW, Kwon BS, Ryu KH, Lee JH, Park YG. The Relationship between Cross-Sectional Area and Strength of Back Muscles in Patients with Chronic Low Back Pain. Ann Rehabil Med. 2012 Apr;36(2):173-81. Epub 2012 Apr 30. This is really a helpful and well researched article about back pain. I learned a lot of new things from this article. Thank you so much.